Fun Foods On a Budget! : Cookie Dough for Preggies! yummy!! I will be sharing this with a couple of preggo friends who can't have the real thing! Thanks!!!!! This looks so good! I just happened to stumble across your blog and love it! I miss being pregnant when i could eat stuff like this and be ok with it! I've been following your blog for a while, but this is the first time I've commented. I love cookie dough, too, and your recipe is very similar to one that I have for cookie dough brownies. It's simple--just bake a pan brownies like normal (I like to undercook them a little), leave them in the pan, refrigerate, and then spread the cookie dough on top, store in the fridge and enjoy! Especially good with ice cream, it's like Ben & Jerry's Half Baked. Those brownies sound so incredible, and I will definitely give them a try sometime soon!! Yum! I can't wait to try this...maybe right now. This looks good! Going to have to try it soon. Just need to buy some chocolate chips to make it. So excited!! I am making homemade ice cream and wanted to add the cookie dough but was worried @ the eggs!! So uh I just got up out of bed & made this after seeing it on pinterest. Holy yum. You're the devil for sharing!! How long do you think this will stay good? I'm not sure how long it will stay good, it's never lasted long enough to find out. If you're concerned that you can't eat it all within a few days, I'd suggest freezing it. Frozen dough is yummy! I was just thinking of making it today for the weekend, we're going out of town. So you think it would be ok to eat for a couple days? It should be okay if you keep it in a cooler, or some kind of insulated container (lunch bag, etc) with an ice pack or two. It's supposed to stay refrigerated. Now that I'm pregnant, I've been dying to lick the spoon every time I make a dessert! 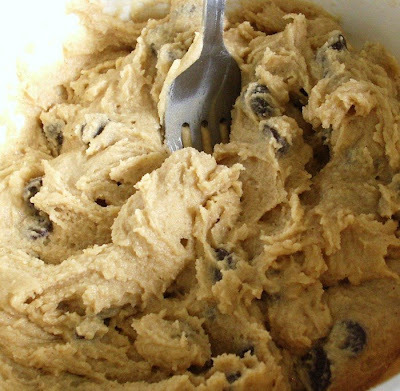 This recipe is perfect for my cookie dough cravings! Thanks!! I just made this and what a treat! I didn't exactly go by the formula, but it ended up working out. I used 2tbsp of Smart Balance(olive oil spread) and 1.5 tbsp of real butter. Then I used a tad bit more brown sugar(an extra tbsp), light Soy milk(all I had), and only used about 75% of the flour... There was NO NEED to refrigerate, the consistency was super thick and perfect the minute I stopped stirring! I know it seems like that's a lot of change, but it only helped the consistency and cut out a good 600 calories or so, which makes me super happy. Thanks for sharing, what a great idea! Only wish I had it when I was pregnant, ha! I am rolling it into balls to freeze for future treats =) Thanks again, you rock! So, I tried this, and it did not turn out well at all. I dont know if it was the missing vanilla or the chunky brown sugar. I stirred it well too but just did not taste good. Anything I need to do? I'm not sure. Did you use an electric mixer or just stir? The texture is better with the mixer. And you could try using white sugar in place of some of the brown. I am 32 weeks and been craving cookie dough. This turned out great! I didnt have choc. Chips so i used walnuts. In the fridge hardening but it lose tasted great. Thank you thank you thank you!!! this is great!! my mom loves to eat raw cookie dough. she's gonna love this. It's my first time being pregnant and didn't know all the things you're not aupposed to eat. Thank you so much for this recipe! Uh I hate to burst everyone's bubble, but we should not be eating raw flour. E.coli is found in raw flour. If there is a way to heat up the flour to kill off the E.coli before making the mix might help. Just in case. i was about to post the very same things Elle Em said. eggs are statistically less likely to give you e. coli than raw flour. try cooking the flour in the oven until it turns nice golden brown. doing that also destroys a lot of the gluten and imparts a nice nutty flavor to the flour. I just tried this, and it didn't turn out at all. It tasted like pure flour and smelled like play dough. I don't know what I did wrong. I followed the directions and used the correct measurements. So, I don't know. but, I'm bummed! I added 1/4 tsp of baking soda to give it more of a real cookie dough taste after i first tested it. really good. thanks! Taste like cake batter! I mean I like cake batter but I wanted cookie dough. I put everything in I was supposed to but instead I regular brown sugar I used light brown sugar. Would that make a difference.? Also I forgot the salt. I don't know... I also put it on the refrigerator. I don't know.. Did anyone else make it and it tasted like cake batter. I found out that I put to much butter!! This is why it tasted like cake batter! O well..... I will Rey it agin! A friend of mine rolled the dough into balls and then dipped them in dipping chocolate. She then let them chill and, OH MY GOODNESS, they were DELECTABLE!!!! Oh my gosh!!! Since when cant you eat raw cookie dough??? I have had six kids and ate raw cookie dough with all six! I also ate sushi and feta cheese which I hear now that the Drs are telling you not to eat!!! I feel sorry for all you young mothers!!! Way to much to worry about! I now have 10 grand kids and everyone seem to be normal!! I still eat raw cookie dough!! I think you are all under to much stress and worrying makes you sicker than raw cookie dough !! I did it a little different. I started out with your recipe and half way through I realized I didn't have milk. So I took my 1/4 measuring cup and put some greek yogurt (strawberry honey) in it and filled it the rest way with water. Gross, I know, I thought so too. Then when it was all mixed together it was a little dark and liquidy so I added a tiny bit more flour and some white sugar and it came out great. Perfect texture/color and flavor, also, it has strawberry honey undertones. Yum. I added peanut butter :P Very good! I made it twice. The first time I followed the recipe exactly and it tasted kind of flowery. After I put it in the freezer it tasted a lot better though! The second time I made it, I didn't have enough regular butter so I put margarine instead. Tasted like cake batter :( dang, I was hoping it wouldn't make a difference because I wanted it so bad but couldn't go to the store. I just made this and it turned out great! Nothing I ever find on pinterest works, but this did! I even used the Splenda version of brown sugar and it still tasted great! Thanks!!! Mmmm! I just follow my regular cookie recipe but add about a tablespoon or two of olive oil in place of the eggs. It doesn't even need to be refrigerated. I just made this and was really disappointed, it tasted awful. Very flowery and I tried to fix it but sadly made it worse. I was excited to try this until I read the reviews, they sound pretty hit and miss and I think it's because we really do have different taste buds and we taste things differently. I've found a cookie dough at the grocery store that is really, really good to eat and it says on the label that it's safe to eat raw. How they do that is they use pasteurized eggs and most likely pasteurized flour as well. It tastes great and comes in a plastic container with a lid so I can grab a spoonful whenever I want. You can buy pasteurized eggs at the grocery store that are safe to eat raw. I haven't looked, but I bet you could even find pasteurized flour. I'm going to look because I would prefer it if I can find it. I don't know who you are, but I love you! I'm a young mom and I have snacked on cookie dough with eggs and brownie batte, while pregnant. My kids are fine. We are getting uptight these days! This is awesome! I used real milk chocolate chips and whole milk (baby is drinking whole) and it turned out to be one of the best treats ever! Thank you so much! I loved this! It is great to have cookie dough that I'm actually allowed to eat! I made it a little healthier. I made it with agave nectar instead of brown sugar, used dark chocolate chips and raw milk. It was really good! I posted the last comment and forgot to mention that I also added Adam's peanut butter to it and it was absolutely delicious! I mixed it slow and easy. Turned out great! This stuff was great! My friend and I tried it and we say it was spot on! I'm definitely going to make it again! Instead of eggs u can use mayo with your regular cookie dough recipe. It's honestly not very good -- too brown sugary. Next time I will do at least 1/2 white sugar. Oh well, live and learn, right!? I've made this twice now and everyone loves it! Thanks for sharing the recipe!!! 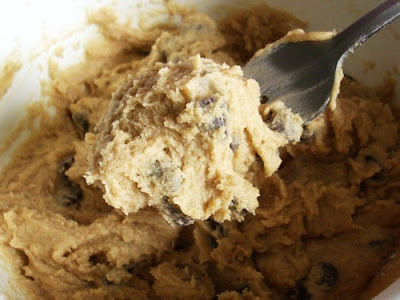 I love this, I am obsessed with cookie dough and literally make this allll the time! I also like to skip the c.chips and sub. almond extract for the vanilla to get more of a sugar cookie taste. That sounds very gross, are you sure you put mayo in it?? I just made this and i'm sorry to say this, but it was not good at all. I dont know what i did wrong!!!! Any suggestions!?!?!?!?!? Is this your adjusted recipe or the original? This is my adjusted recipe. The link to the original recipe is at the top of the post. The original recipe is actually cookie dough to use in ice cream. i tried making this last night... something doesn't taste right, not much taste at all, tastes mostly like butter, any suggestions? I found a cookie dough cupcake on pinterest, but the reviews changed the recipe and they said it was better. Thank you for changing the recipe based on the reviews for me. Made this last night, it was a little too floury even though we followed the directions perfectly. So we added a little more brown sugar and milk and it made the cd soooo much better. YUMM thanks for sharing this. Instead of milk, I used cream, which made the dough very smooth and very tasty. I've made this several times and I love it! Most recently, I've added a scoop of vanilla protein powder and it's great! This looks amazing! And to all you "older" moms who are chastising young moms for avoiding foods that are KNOWN to carry dangerous bacteria, shame on you! You and your kids may have "turned out fine" but some may not have been so lucky. E. coli, salmonella, and listeria are not to be messed with. We used white chocolate chips, and it was delicious! This recipe had waaaay too much milk! You just made this pregnant lady VERY happy! I love your blog, especially the recipes with chocolate! I'm a student at Oberlin College, and I have recently done a lot of research into Fair Trade/fairly traded chocolate. After learning that the majority of the chocolate in production comes from slavery, including child slavery and trafficking, I became very committed to this cause. I love baking, especially with chocolate, and I have collection of food blogs that I love. I'm beginning to contact my favorite bloggers, one by one, and recommend Fair Trade, Rainforest Alliance, or other fairly traded chocolates, if you don't know about or use them already. Some of the "Big Chocolate" companies that use slavery in the production of its cocoa products include Hershey, Nestle, Godiva, Lindt, and many, many more. This documentary has absolutely changed my life. If you're interested in knowing more about the horrible abuse and slavery happening right now on Africa's Ivory Coast, please check it out! "Purchase chocolate products from companies who only use cocoa that has definitively not been produced with slave labor. These companies include Clif Bar, Cloud Nine, Dagoba Organic Chocolate, Denman Island Chocolate, Divine Chocolate, Equal Exchange, Gardners Candies, Green and Black's, John & Kira's, Kailua Candy Company, Koppers Chocolate, L.A. Burdick Chocolates, Montezuma's Chocolates, NewLeaf Chocolates, Newman's Own Organics, Omanhene Cocoa Bean Company, Rapunzel Pure Organics, Shaman Chocolates, Sweet Earth Chocolates, Taza Chocolate, The Endangered Species Chocolate Company, and Theo Chocolate." Thank you so much for your time, and for your beautiful blog. If you would like any resources about where you can buy slave-free chocolate, please let me know! Hot Fudge Cheesecake - Finally!! !